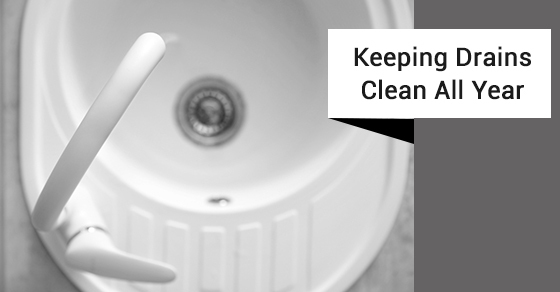 Keeping your drains clean all year round is not only good for convenience purposes, but also key to ensuring that you avoid major plumbing issues. With that in mind, here is how you can keep your drains clean all year round. The leading way to keep your drains clean all year round is to be very careful about what you put down them. You would be surprised to hear all of the seemingly innocuous things that can actually wreak havoc on your drains. When it comes to the kitchen, cooking grease and even small bits of food need be avoided. Add a screen to your kitchen sink drain to collect any food scraps. When it comes to the bathroom, things like wet wipes and coffee grounds should not be flushed down the toilet. Compost your coffee grounds instead. Running hot water down your kitchen sink prevents oils and other products from building up in the inside of the pipes. You can also use vinegar. If you choose the latter option, give it 30 minutes to do its job and then follow it up with hot water. The acetic acid in vinegar acts as a great organic solvent. The final two tasks that homeowners should put into practice in order to ward off plumbing problems all year round is to do monthly drain maintenance and to schedule in professional drain cleaning services once a year. Every month, check the state of your drains. Ensure that water is running as it should and check for any odours. Check the condition of your pipes. Are your toilets flushing as normal? As for a yearly plumbing inspection, this is key to ensuring that your plumbing system is in tip-top shape and to identify problems that often go undetected to anyone but a licensed plumbing professional. Yearly plumbing inspections can also ensure that your plumbing system is running as efficiently as possible, therein saving you money on your monthly utility bill. If you are in need of first-rate drain cleaning services, contact our team of experts at Brothers Plumbing today. We use the latest technology and high-quality materials to maximize the performance of your plumbing system. We are one of Toronto’s leading plumbing providers with over 50 years in the industry and offer affordable rates. 130 Osler Street, Toronto, ON, M6N 2Y8. © 2019 Professional Plumbing Company - Brothersplumbing.ca. All Rights Reserved.